Put everything in a blender or food processor (see my previous post for thoughts on blenders) and turn to high power following your blender manufacturer’s instructions. Use the blender’s tamper to force the ingredients into the blades as it blends. If your blender doesn’t have a tamper, turn the power off every 15 seconds to prod the chunks toward the blades and the smooth stuff away with a wood or plastic spoon. Remove the spoon, put the lid back on and star the motor up again. Blend until smooth (30 seconds to a minute in a Vitamix), but don’t overblend or it will start to melt. Scrape from the blender when it’s about the consistency of soft-serve. I use an ice cream scoop to make it pretty. If you want a firmer ice cream, stick your ice cream scoops in the freezer for a couple minutes before serving. 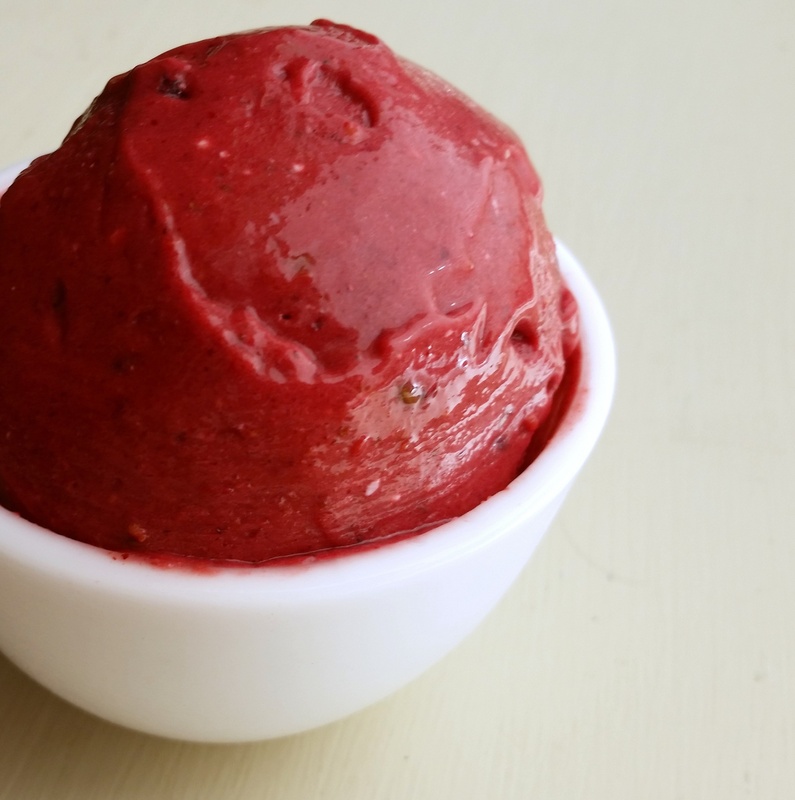 I added juneberries to boost the color without making the ice cream too seedy. Feel free reduce those and to increase the black raspberries, but keep in mind that black caps have a lot of seeds, so it could negatively affect the texture. Pears help sweeten the mix.